I guess this goes to show nothing online is completely dependable. Amazon.com, one of the world's biggest Internet retail sites, has crashed and is still down as of this writing. Apparently, this is the second time this month, though I missed it the other occurrence on June 6. From what I read about that first incident, they apparently don't know what caused it then either. Maybe the government is trying out the new Internet kill switch - testing it on Amazon first? Most of the books and other products linked to from this site are on Amazon, so the links won't work until this is fixed, which hopefully won't be long. When it does come back up, I hope all the complex interactive parts of the site are still functional, for example the Wish List feature. As of now, the Shopping Cart and Wish List are both empty. The weird thing is that sometimes a product (like my book) will come up, but the page has no details, or shows that the item is not available, or that there are no customer reviews yet. Maybe it will all be intact again when it's back to normal, who knows? I've had a few inquiries from readers asking about the availability of Bug Out in bookstores, so I wanted to give you an update from what I've found out so far. First of all, the book may be in your local big chain bookstore, but perhaps not where you would expect to find it shelved. 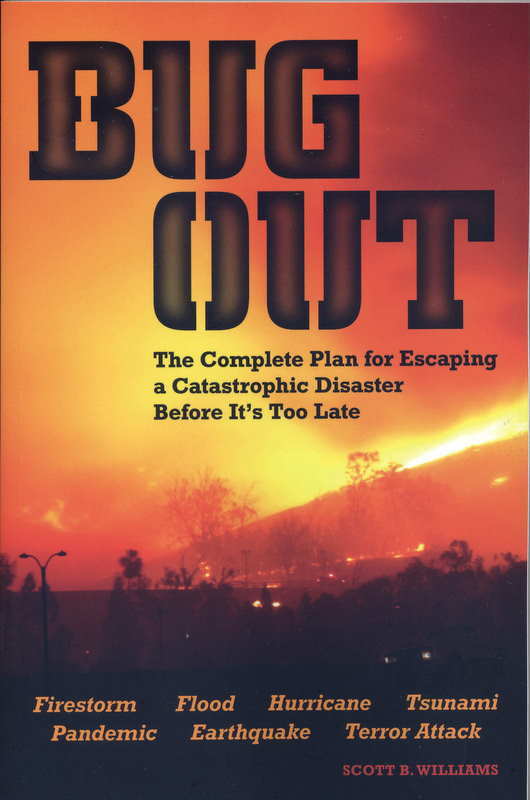 If you look at the category that it's classified in on Amazon , you'll see that it's in Nonfiction>Current Events>Disaster Relief, rather than in a category such as Outdoor Survival Skills or Wilderness Survival. This is also true of a few other survival books related to a breakdown or collapse type scenario. How individual bookstores organize their inventory is mystery to me and probably to anyone else who is not a bookstore manager, so if you are looking for this book or any other related one, the best thing to do is ask an employee or look it up on the self-serve computer system. Besides, if they don't have it, any bookstore can order practically any book in print, so they can get if for you if you don't want to order it online yourself. What I found in my local stores is that Barnes & Noble had none in stock, Borders had several copies in the outdoors/hunting/survival/hiking/camping/etc. shelves, but Books-A-Million placed the book up near the front of the store, in the Political and Social Sciences section. In the same area I noticed several other related titles that are are also on Amazon's Top 100 list in "Current Events" along with Bug Out. Speaking of which, I'm delighted with fact that readers are finding the book useful and some are posting reviews around the web in various places. Two more recent ones are from Mayberry, over at Keep It Simple Survival, and from Scott Finazzo at Lure of the Horizon. "Lure of the Horizon is not only the title of this blog, it is a strong force in my life. As both a blessing and a curse, the restless soul has an affinity for the horizon; for something more, something new. I cannot change it, I can merely attempt to control it."